Ancient and glorious, the sprawling stone structures of UNESCO-listed Angkor Wat have long been Cambodia’s main draw-card. Few people realise, however, that the country has an extensive collection of lesser-known temples that lend it a mystical, storied air rarely found elsewhere. 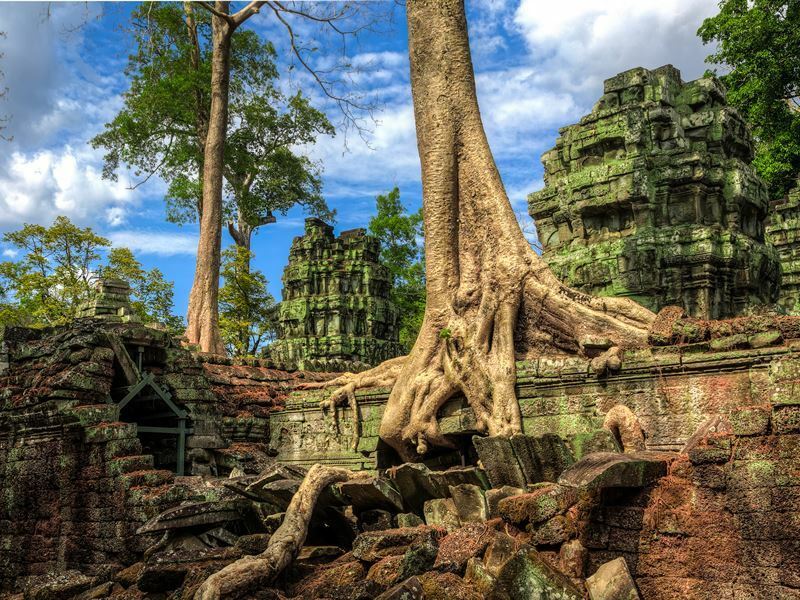 From pyramidal terraces rising above the jungle canopy to carved stone doorways now entangled in roots, there’s a plethora of spellbinding temples and structures to discover on a trip to Cambodia. Many of these man-made marvels were built more than a thousand years ago by the ancient Angkorians who worshipped the Hindu gods, and later Buddha. One of the most advanced civilizations of their age, their empire centred on north-west Cambodia around the modern day city of Siem Reap where a series of capitals were built. This is where you’ll find the most majestic ruins; monuments to both spiritual devotion and human endeavour. There are said to be more than a thousand Hindu temples and other structures knitted into the farmlands and forests north of Tonle Sap Lake and south of Mount Kulen. Some have never been fully uncovered, while others have been tended and protected as part of the immense Angkor Archaeological Park that covers more than 400 square kilometres. 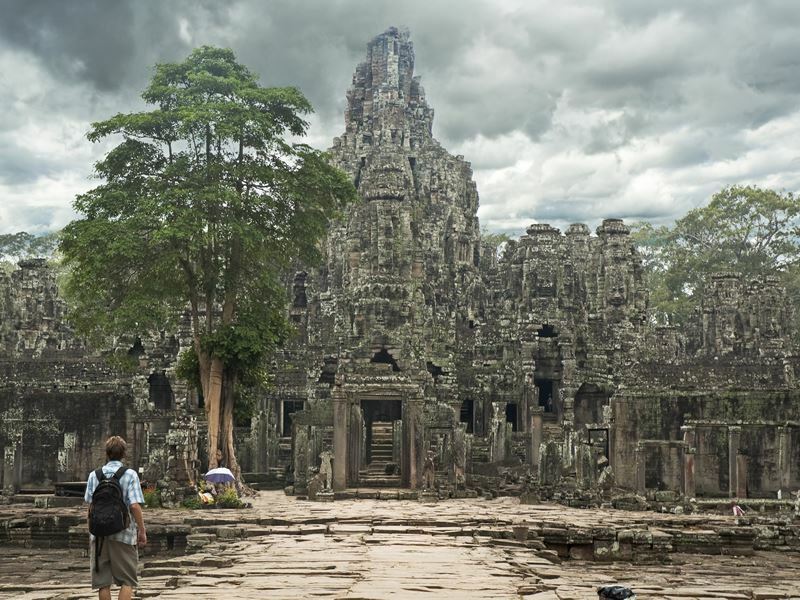 Angkor Wat is undoubtedly a must-see travel icon, but there are other famous sites nearby such as Angkor Thom with its Terrace of the Elephants, plus the root-entangled Tomb Raider temple of Ta Prohm that are simply not-to-be-missed. Cambodia also has two other UNESCO-listed temples – Preah Vihear and Sambor Prei Kuk – which offer a more remote and atmospheric experience. Once you’ve ticked those off your list, Cambodia’s other treasures are often equally as beguiling and without the attendant crowds. 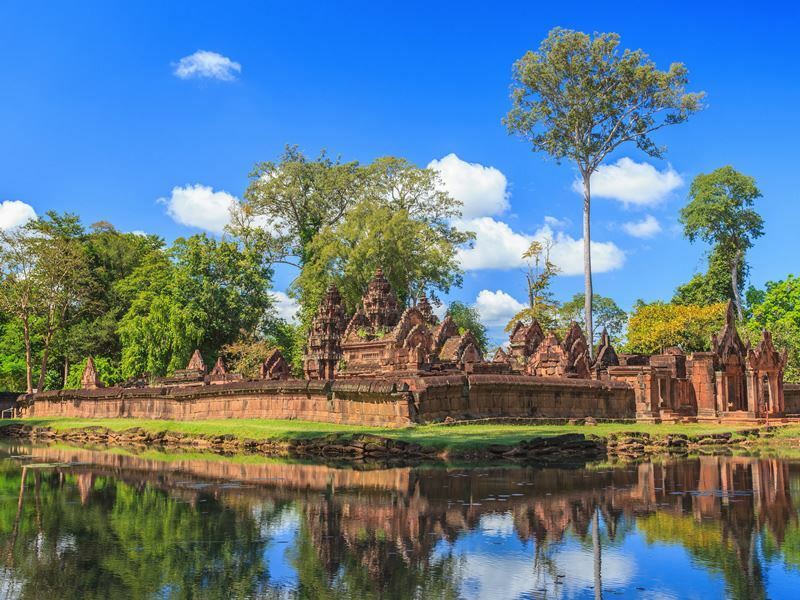 Here’s our handy guide to the best temples beyond Angkor Wat. The rose-coloured Citadel of Women is a breathtakingly beautiful work of art made from pink sandstone, with each surface carefully carved and decorated in bas reliefs. The Hindu sanctuary contains four enclosures crowned by magnificent tiered roofs and featuring remarkably well-preserved statues. 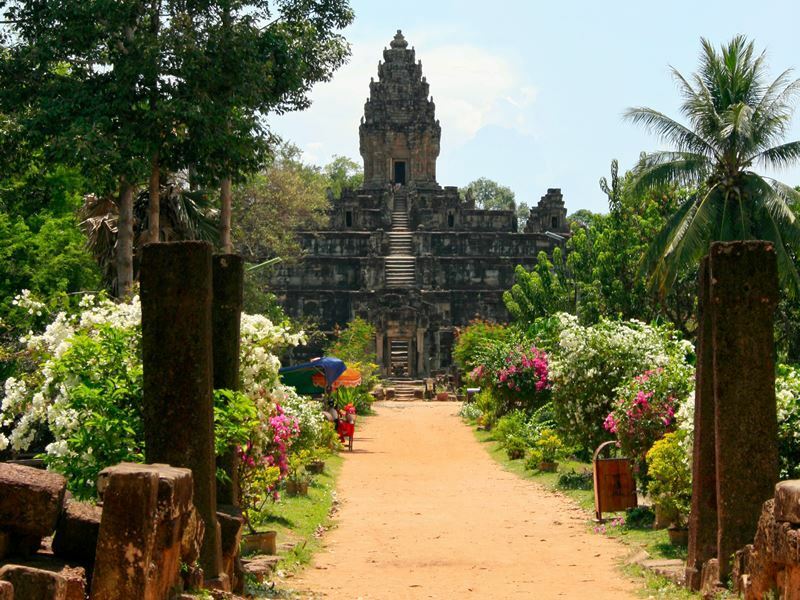 Built by a Brahmin priest in the 10th century and dedicated to the Hindu god Shiva, it’s small compared to the monuments constructed by the Angkor kings and is set slightly north of the main archaeological area. Entering the citadel offers one of Cambodia’s most magical experiences, and although a popular excursion from Siem Reap, it’s usually more peaceful than other temple sites. Crowning a high plateau with the most spectacular setting of all Cambodia’s Angkor temples – and UNESCO-listed to boot – Preah Vihear should be firmly on the travel radar, but its tricky location has kept it out of the spotlight. Until fairly recently a border dispute with Thailand meant the area was off limits to ordinary travellers, plus its distance three hours by road from Siem Reap means it can’t be easily visited on a day trip from the city. For those willing to go the extra miles, the reward is a virtually deserted heritage hotspot featuring tumble-down stone temples in richly engraved enclosures with stirring views over verdant plains. Tucked inside the rainforest, the medieval temple of Beng Mealea encompasses terraces, enclosed sanctuaries and walkways flanked by sculptures of snakes, demons and deities, all carved almost a thousand years ago from massive sandstone blocks. It has largely been reclaimed by nature with tree roots bursting through stone entrances and boulders blanketed in moss. 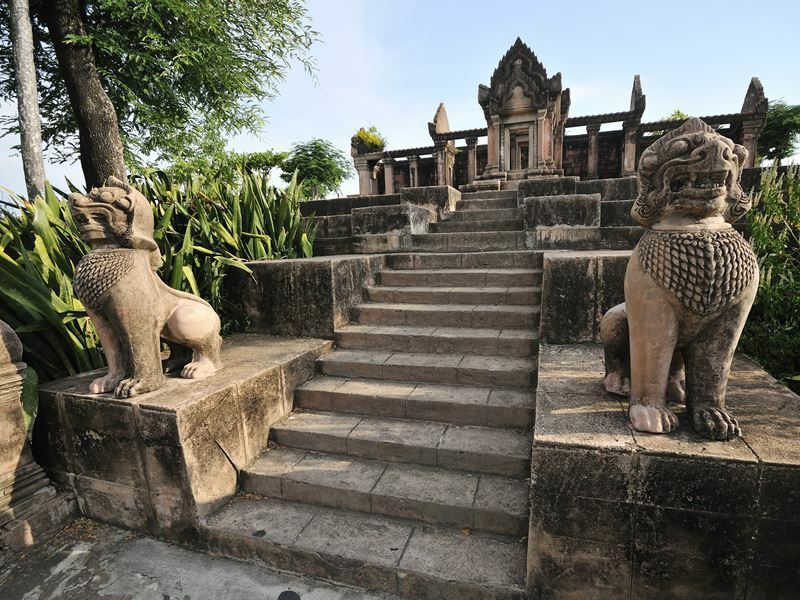 Unlike some of Cambodia’s other treasures, the site is unrestored making it a real adventure playground where you can channel your inner Indiana Jones to explore ruined chambers engraved with elaborate Hindu imagery. Set beyond the limits of the main Angkor area, Beng Mealea is slightly off the beaten track, around one-to-two hours’ drive from the regional centre of Siem Reap. The last great capital of the ancient Khmer kingdom, Angkor Thom was once a well-fortified walled and gated city surrounded by a moat and housing the empire’s most important officials and priests, as well as King Jayavarman VII himself. Built not far from the earlier temple-city of Angkor Wat, its ten square kilometres of terraces were crafted with great care and creativity and include celebrated features such as the magnificent Terrace of the Elephants viewing platform and the Royal Terraces. A causeway flanked by menacing statues leads from the city gates to the many-faced Temple of Bayon, which is another of Angkor’s iconic sites. Visitors have the feeling of literally being watched over by the gods as more than fifty towers rise from the upper terrace, each topped by a carved Buddha face with a peaceful expression believed to represent Avalokitesvara, the bodhisattva of compassion. Visit in the early morning to see the faces at their most glorious – bathed in the soft golden light of the rising sun. Away from the tourist trail, remote Banteay Chhmar is Cambodia’s least understood temple complex, though its potential importance to history puts it in line to be the country’s next UNESCO World Heritage Site. Far from the main archaeological sites around Siem Reap and close to the border with Thailand, it is thought to have been commissioned by Angkorian king Jayavarman VII who built Angkor Thom. Known variously as ‘the small citadel’ or ‘the citadel of cats’, the site has been largely given over to nature. It retains a romantic air of abandonment that makes it ripe for exploration with carved lintels enveloped in thick vines and stone heads emerging from between curving roots. You can scramble over the remains to discover precious ancient reliefs and overgrown galleries with no other visitors to break the spell. Although it’s four hours by road from Siem Reap, a tourist office, home-stays and places to eat close by make it more accessible to travellers. 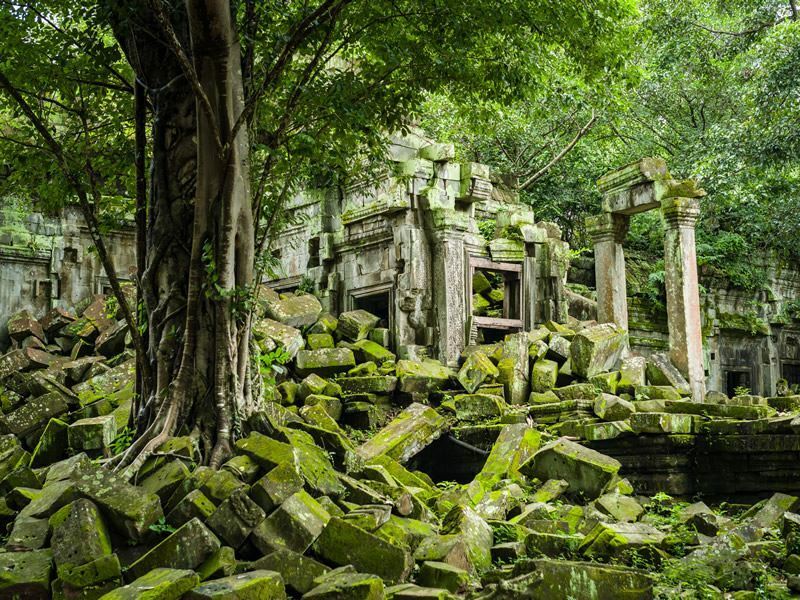 Discovered hidden in dense jungle not far from Angkor Wat, the much-photographed temple of Ta Phrom has become known as the Tomb Raider temple for its part as a set for the famous Lara Croft movie. 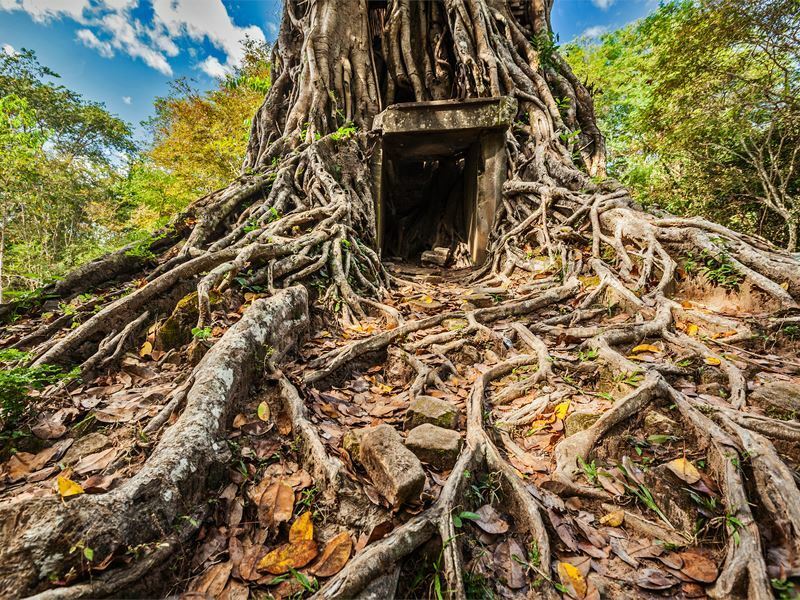 Wrapped in wizened fig trees and creeping vines, the temple has been left in much the same state it was found with its tiers and doorways crumbling and half collapsed. Mysterious darkened galleries and crevices abound lending the ruins a real sense of adventure. Just as Angkor Wat is a popular place to watch the sunrise, Ta Phrom has become a hot spot to see the sun go down. 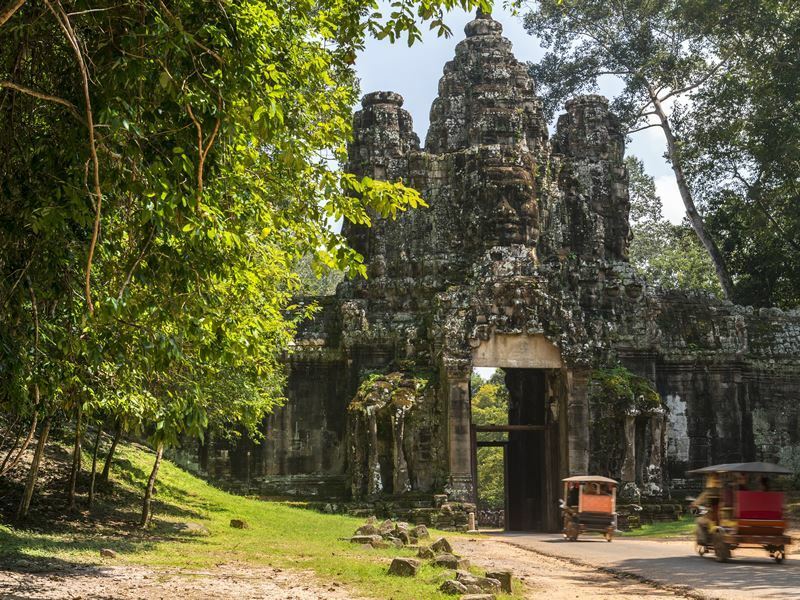 If feeling like an early explorer trekking to forgotten temples consumed by jungle is an undoubted highlight of travel in Cambodia, Sambor Prei Kuk certainly delivers where others fall down. 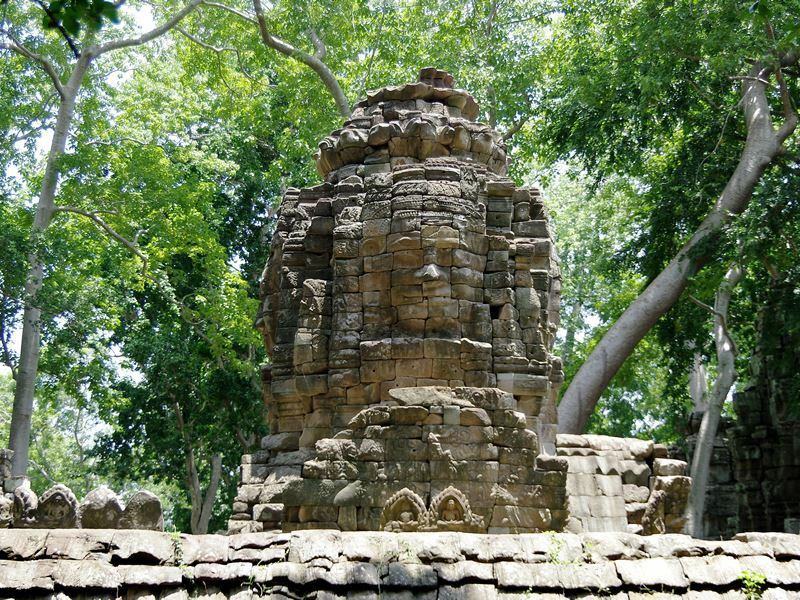 Knitted into the forests beside Tonle Sap Lake, scores of small temples pre-dating the Angkor Empire are scattered in shady glades. Away from Siem Reap, it receives far less tourists than other temples, though it’s likely to get more attention with its recent designation as Cambodia’s third UNESCO World Heritage Site. The riverside town of Kompong Thom is a pleasant base for travellers looking to stay in the area. A clutch of temples dating to the earliest period of the Angkor Empire, which was among the most advanced of earth’s ancient kingdoms, the three temples of Roluos are thought to have been constructed under King Indravaraman I in the 9th century. Known as Bakong, Lolei and Preah Ko, the tumble-down temples with eroded masonry have began to resemble pyramids, though carved pillars and lintels are still visible. Dedicated to Hindu god of destruction and creation Shiva, Preah Ko is the oldest of the buildings, while Bakong is the most impressive, and a smattering of statues add to the area’s appeal. Just a dozen kilometres east of Siem Reap and close to Tonle Sap Lake, the Roluos temples are never-the-less beyond the bounds of the main Angkor Archaeological Park and are often blissfully crowd-free. Not technically a temple, but rather an engraved stone riverbed that has to be seen to be believed, the Valley of 1,000 Lingas has an air of magic and mystery. 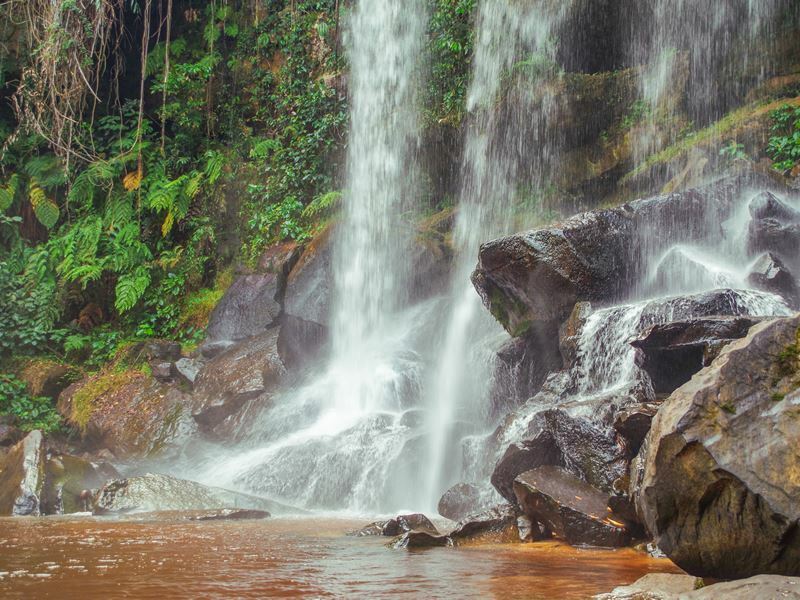 Running down through the jungle-clad slopes of Mount Kulen, the river is reached by a short trek through the rainforest of Phnom Kulen National Park, just north of Siem Reap. Depictions of Hindu deities have been etched into the rocky river banks and can be seen beneath the clear water. Archaeologists believe most of the lingas or carvings were made in the 11th century during the reign of King Udayadityavarman II. You can also explore the surrounding forest to glimpse yet more remnants of a lost civilization including the astonishing stone animal sculptures of Srah Damrei. Covered in moss and eroded by the elements, the shapes of an elephant and lion are still unmistakable. Temple hunters can find another Angkor ruin here too, as the three-tiered pyramidal temple of Prasat Rong Chen is nestled in the forest close by.